Are iPad magazines being killed by greed? Tablet-based magazines have a lot going for them. They’re more interactive, more portable and better for the environment than their paper-based counterparts. The problem is, when they’re priced way above the odds, who’s going to buy them? Pete Kafka at All Things Digital reports today that publisher Conde Nast is set to increase the price of the iPad versions of its Vanity Fair and GQ titles by $1 and $2 respectively. The reason is increased production costs after they switched from an in-house publishing system to an Adobe-built solution, but the result? Well, digital magazines haven’t exactly taken off so far. Who’s going to want them at an even higher price? When GQ launched for the iPad last May, the magazine’s vice president of publishing Pete Hunsinger said, “This costs us nothing extra: no printing or postage… Everything is profit, and I look forward to the time when iPad issue sales become a major component to our circulation.” Well, that’s only going to happen if that reduced production an distribution cost is fairly represented in the price consumers pay. It’s not just the publishers being greedy, either. Since the introduction of its 30%-grabbing iPad subscription programme recently, have you heard of any publishers jumping to sign up? No – they’re all up in arms about having to either take a hit on their profits or increase their prices. It looks like between them, Apple and the publishers are killing iPad magazines with greed. 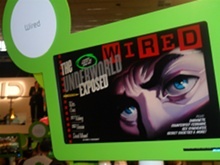 Conde Nast was showing off Android editions of Wired and The New Yorker at Mobile World Congress last month. They’re set to launch exclusively for the Motorola Xoom at first, with support fort more tablets over time. Google has taken a much lighter approach to paid content with the 10% commission on its recently launched One Pass system. Might Android end up being the natural home for digital publishers looking to make a decent profit? That depends if Android tablets can ever compete with the iPad on the initial cost of the device. At present, we’ve yet to see an iPad equivalent Android tablet that matches it at price too. So, right now it appears that there’s virtually no way to make magazines appealing on tablets. They’re either on the iPad and expensive or unprofitable, or on Android with a minuscule audience. Either way, maybe they’re simply not ready for ready for the mainstream thanks to one other important factor – production costs. At first glance, it makes no sense whatsoever that I can buy a year’s subscription to Wired’s UK magazine for £24, a price that would get me just ten issues of the iPad version. However, what’s saved on printing and trucks is more than made up for in additional development costs, it seems. Wired’s Chris Anderson said recently that developing its iPad application currently requires 20% extra resources over the print version, due to the inclusion of interactive elements and video. In time, when production costs for ‘whizz-bang’ extra features reduce and its audience grows, maybe Android will emerge as the perfect home for tablet-based magazines. That said, maybe Apple will make iOS more publisher friendly by reducing its 30% cut or improving terms for publishers in other ways. Either way – for now tablet magazines remain an expensive luxury. I’m sticking with paper.